Climate anomalies punctuated the last ice age, characterized by the discharge of icebergs that released fresh water into the North Atlantic Ocean. It now emerges that fresh water also sometimes flooded the North Pacific. Kaustubh Thirumalai is in the Department of Earth, Environmental and Planetary Sciences, Brown University, Providence, Rhode Island 02912, USA. Abrupt cold snaps known as Heinrich events occurred during past ice ages1. These millennial-scale periods of colder climate were associated with massive influxes of fresh water to the North Atlantic Ocean. The influxes were caused by discharge of icebergs from the Laurentide Ice Sheet — an immense sheet of ice that covered most of central and eastern North America during glacial epochs (Fig. 1). Studies of such events are of great interest because they could help to indicate whether rapid reorganizations of ocean circulation might occur in the future, and how they might affect climate2. 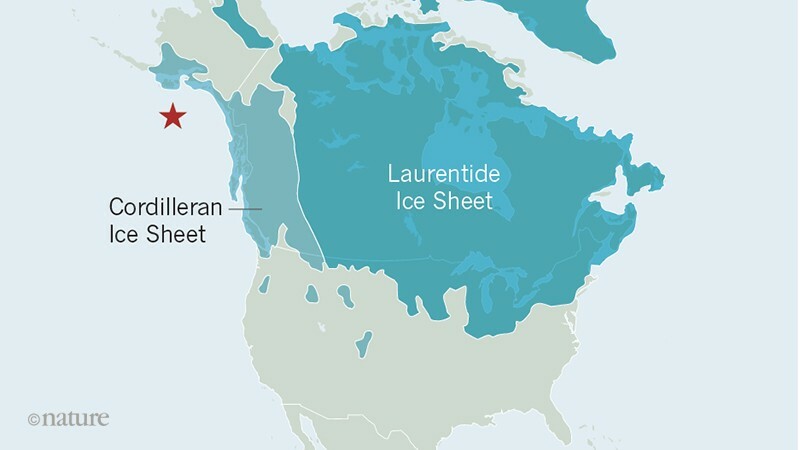 In a paper in Nature, Maier et al.3 investigate how Heinrich events affected the North Pacific region during the last glaciation (roughly 115,000 to 12,000 years ago), and the influence of the Cordilleran Ice Sheet, North America’s western counterpart of the Laurentide Ice Sheet. They report links between changes in ocean circulation in the North Atlantic and melting of the Cordilleran Ice Sheet. Figure 1 | Ancient ice sheets. During the last ice age, North America was covered by a complex of ice sheets, including the Laurentide Ice Sheet over the centre and east, and the Cordilleran Ice Sheet across the west; this map shows the maximum extent of the ice. 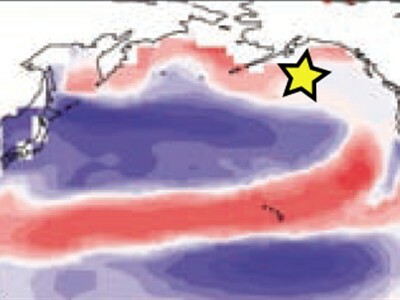 Maier et al.3 analysed oxygen isotopes in the remains of organisms called diatoms trapped in sediments taken from the North Pacific Ocean (the star indicates the location of the sediment core studied). The changing ratio of isotopes in different layers of sediment reflects changes in the salinity of the sea water in which the diatoms lived. The isotopic measurements reveal that fresh water inundated the North Pacific during certain Heinrich events — millennial-scale periods during which the climate was anomalously cold. The authors conclude that the fresh water came from melting of the Cordilleran Ice Sheet. There is abundant evidence that fleets of icebergs episodically surged into the North Atlantic during the last glaciation. Heinrich events were initially identified from the coarse, ice-rafted detritus that forms layers in marine sediments1. Numerous palaeoclimate records have since been obtained showing that ocean cooling and freshening (freshwater influx) occurred across the North Atlantic during Heinrich events4. The subsequent alteration of the Atlantic Ocean’s circulation weakened heat transport between the hemispheres, and is hypothesized to have induced global temperature and precipitation anomalies through both atmospheric and oceanic pathways5. Maier et al. now report a study of marine diatoms — single-celled plankton that have shells made from silica — preserved in open-ocean sediments from the northeastern North Pacific (Fig. 1). The authors measured the ratios of stable oxygen isotopes in the diatoms. These ratios reflect past changes in the temperature and isotopic composition of sea water, which, in turn, vary with changes in global sea level and local salinity. The same principle was used in earlier studies8 of planktic foraminifera, but diatoms can thrive in colder and less saline environments9 than can many planktic foraminiferal species. Maier and colleagues’ measurements reveal that large and abrupt intrusions of low-salinity waters occurred at their study site, coinciding with the timing of some Heinrich events. The authors interpreted these intrusions as evidence of meltwater originating from the Cordilleran Ice Sheet. The researchers went on to carry out a series of computational climate-modelling experiments, of a type known as hosing experiments. Such simulations are used to study anomalies in global climate and ocean circulation that arise in response to abrupt climate change, and involve artificially introducing fresh water into the oceans at high latitudes, typically routed to the North Atlantic5. Maier et al. extended the hosing approach in two ways. First, they used a climate model that represents isotopic tracers, which thus enabled a more direct comparison of the simulations with their measurements. And second, they performed two sets of simulations, one in which only the North Atlantic was hosed, and the other in which both the North Atlantic and North Pacific were hosed. The authors found that the simulation in which freshwater input was confined to the North Atlantic did not indicate that low-salinity waters entered the North Pacific Ocean, contradicting the findings from their diatom measurements. Despite this difference, the simulation did reproduce the ocean–atmosphere dynamics thought to have occurred across the Pacific in response to perturbations in the North Atlantic5. It also revealed poleward routing of warm, subtropical ocean waters due to shifts in tropical rainfall. Maier et al. therefore propose that the rerouted warm waters might have been responsible for the melting of parts of the Cordilleran Ice Sheet, adding fresh water to the North Pacific — a scenario that they could model by hosing the North Pacific as well as the North Atlantic. Indeed, when the authors simulated this scenario, it provided a better match to the diatom observations. Moreover, the simulation suggests that salinity changed only negligibly at depth in the North Pacific. This might explain why no change in salinity was recorded in the isotopic study of foraminifera — it is thought that these organisms do not dwell at the topmost part of the ocean in this region. However, the diatom data indicate that freshwater influxes to the North Pacific did not occur during every Heinrich event. This could be because all Heinrich events are not created equally1,4. Sure enough, when Maier and colleagues performed additional simulations of North Atlantic perturbations involving exceptionally cool background temperatures, they found that the conditions produced were not conducive to melting of the Cordilleran Ice Sheet. The new study is a major advance in our understanding of freshwater events in the North Pacific, but questions remain owing to the limitations of the time resolution of the sediments in the core that was analysed, and because the low abundance of diatoms in some sedimentary layers prevented the authors from carrying out their analysis for the corresponding periods of geological time. For example, the lack of evidence of freshwater pulses in proxies of the North Pacific surface ocean during some Heinrich events is puzzling, given the presence of glacial detritus. Furthermore, we still do not know how stable the Cordilleran Ice Sheet would be in response to shifts in Pacific climate that are unrelated to Heinrich events. Importantly, further research is required to determine whether Cordilleran-meltwater events influenced circulation in the Pacific, or even in the Atlantic. More broadly, a more-refined understanding of Cordilleran-meltwater pulses and the associated effects on regional temperature and precipitation will benefit our theories of abrupt climate change. Heinrich, H. Quat. Res. 29, 142–152 (1988). Liu, W., Xie, S.-P., Liu, Z. & Zhu, J. Sci. Adv. 3, e1601666 (2017). Maier, E. et al. Nature 559, 241–245 (2018). Hemming, S. R. Rev. Geophys. 42, RG000128 (2004). Okumura, Y. M., Deser, C., Hu, A., Timmermann, A. & Xie, S.-P. J. Clim. 22, 1424–1445 (2009). Hendy, I. L. & Cosma, T. Paleoceanography 23, PA2101 (2008). Lopes, C. & Mix, A. C. Geology 37, 79–82 (2009). Maier, E. et al. Paleoceanography 30, 949–968 (2015). Harrison, P. J. et al. Prog. Oceanogr. 43, 205–234 (1999).